Yup tutors have a lot to do in-session. Remembering which tools to utilize and when, using growth mindset language, and typing quickly – all while teaching math and adapting to students’ needs! This role requires a significant cognitive load, and with so many specifics to remember we know it isn’t easy to stay on top of everything. We hope this will increase student satisfaction and learning while making your job easier. 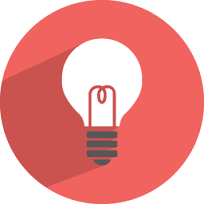 As you notice the prompts this week, please tell us what you think in the #new-ideas Slack channel! We review comments regularly to inform future feature requests and changes. Is your student using an unfamiliar or unusual solution method? Avoid discrediting the student or their teacher’s method, which could come off as rude or disrespectful. Instead, ask for a snap of their notes or textbook to gain more insight into the method or check with #tutor-chat (or Google) for support! Coverage Reminders: Both Riemann Sums and calculating volume with integrals fall within Yup’s concept coverage. Please take a moment to brush up on these concepts if you are not already familiar. Take care to click the “End Shift” button when finishing shift to ensure we are accurately logging your shift time. Refreshing the page after clicking will confirm if the shift is ended. Avoid claiming new shifts unless you are confident you will be able to commit to covering them. For temporary available shifts, check the Claimed Shifts sheet to see which shifts you have claimed. We recently worked with a data analyst and PhD student out of Stanford University to learn more about how our new Achievements feature impacts student learning. Here are some of the findings from the session analysis that we are excited to share. Overall, trends suggest that students have a more enjoyable experience when they earn achievements! Great work, tutors! Going forward, let’s aim to not only send multiple achievements in every session, but to use authentic language when sending them. For example rather than saying “Here – take a Great Grit badge!“, explaining “Way to push through a tough problem – you earned a Great Grit achievement 🙂” will make the experience more meaningful for the student. 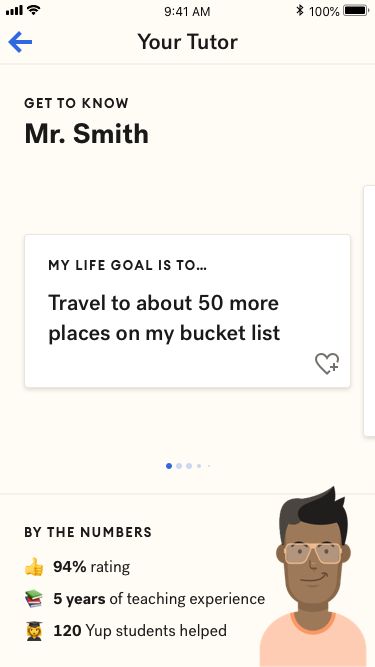 Recently we reached out to the tutor team to collect fun biography facts – everything from your favorite food to your dream job. We have used these answers to create tutor bios which students can access from the session screen. This feature is live as of today! We believe that providing students with context about their tutors will create a more human learning experience. Your student can interact with the cards and ‘heart’ them if they enjoy the fact. Some students may even ask you about your answers – we invite you to engage with the student while keeping professionalism in mind! Today, we released an whiteboard update that will enable you to zoom in on and rotate student and whiteboard gallery images to speed up the image reviewing process. As part of this update, we also gave the whiteboard tools pane a refresh. Check out the new whiteboard guide for details and instructions! Another part of this update are fixes to commonly-encountered whiteboard rotation issues – if you select a landscape image from the session images pane or the chat stream, the whiteboard orientation will now automatically adjust to landscape. Coming soon: when students take photos in landscape orientation, we will attempt to detect that and display the image in landscape orientation without you needing to rotate it first. 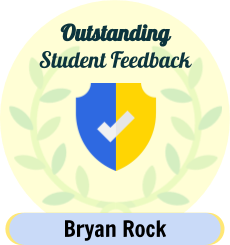 Congratulations to Bryan Rock for earning the Outstanding Student Feedback Award! This award is given to tutors who receive consistent, outstanding written feedback from students over several weeks along with demonstrating excellent overall performance. Way to go Bryan! As an education platform, allowing incorrect answers to slip through the cracks violates a fundamental trust for the students and parents depending on our service. Unfortunately, the Wrong Answer tag is one of the most frequently assigned session tags by TQMs. A number of in-session issues we’ve seen become more prevalent can be easily fixed by the student by updating their app. Two specific issues caused by outdated apps are missing or disabled achievement buttons and duplicated session messages. When you notice the above errors, asking the student to update their app – at the end of the session – will ensure they are having the best possible experience. Starting immediately, we ask that you use the Tutor Dashboard’s built-in Report Bug button to let us know about technical issues you face. We invite you to continue to use the #system_issues room on slack to communicate with other tutors about bugs after reporting via Report Bug (UserSnap). Additionally, if a bug you are facing is significantly impacting your shift, please continue to let us know via tutor.support@yup.com. Click the ‘Report Bug’ button on the bottom right of your tutor dashboard to launch the bug reporting screen. Use the pen tool to mark your screenshot if necessary and use the comment box to tell us more about the bug. For example, instead of saying the session is lagging, try saying messages/images/whiteboard are taking a long time to send, or messages are out of order/repeating in the session. Always include your email, the date, time and time zone in order to better find and investigate bugs reported. Click “Send” when you are done illustrating and explaining the bug that you are experiencing. Check out the Yup Bug Reporting Instructions doc for more details. Use the canned responses filed under Initial Probing along with the student’s answers to the pre-session questions to speed up Gap Clarification Phase. As of this month, Yup tutors have sent over 15,000 Achievements to students! 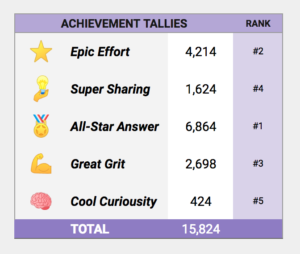 The team’s favorite Achievement to send is All-Star Answer with close to 7,000 awarded since the feature launched in late November 2018. Let’s keep this trend going, all! 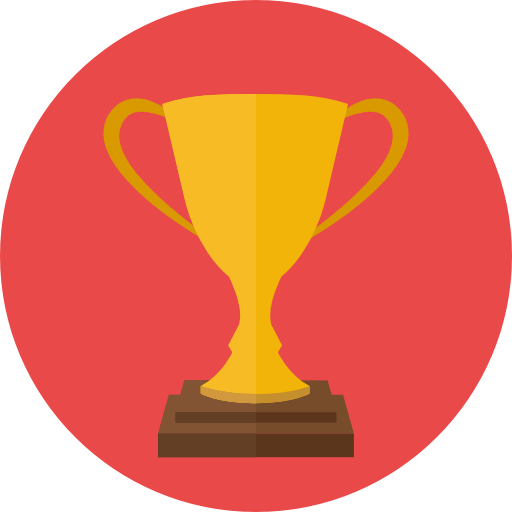 The record for most Achievements sent in a single session is Session #406409 in which veteran tutor Bharathi Vavilakolanu sent 26 Achievements over 108 minutes! Keep up the great work and happy tutoring!